Is a 50mm-wide arca-mount a standard? I have a cheap tripod that have a 50mm wide arca-style mount. Is this a standard or some random thing? There's actually no such thing as an Arca-Swiss Standard. Different manufacturers that make "arc-swiss" products make them in slightly different width, height, and slant variations. Some work with each other with varying degrees of compatibility, others do not. 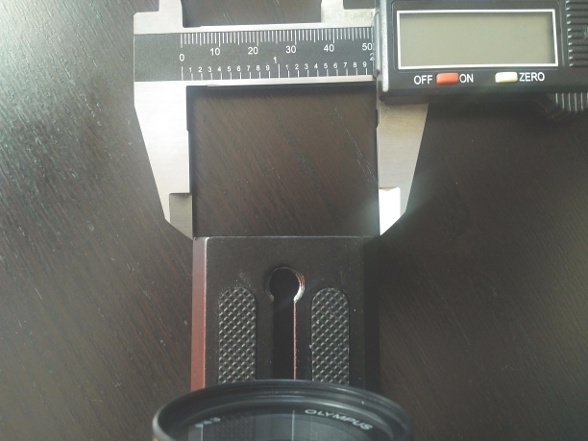 In the case of your tripod release plate, however, it is considerably wider than even the most liberal use of arca-swiss compatible and would be considered a manufacturer's proprietary format. Arca Swiss style mount plates have dovetails, this one doesn't. I think this is a manufacturer specific mount. Please see Michael's answer - even precision made AS style equipment is not guaranteed to be compatible across brands. I was wrong assuming brands followed a pattern just because i saw a lot of 38mm dovetail mounts i thought they where some sort of standard. btw all the generic ones call out "dji mount" so i guess this is the answer, though i had never heard of dji before. Maybe i'm too out of the stabilizer crowd as this is what their website says they do? Not the answer you're looking for? Browse other questions tagged tripod quick-release or ask your own question. Do GoPro mounts use standard tripod points? Which tripod plates are compatible with the Nikon D7000? How can I make my heavy lens tripod setup usable for my non-heavy lenses? Is there anything I can buy to use downward tilt on Sony A7 on Tripod?